Zoom's recorders have always been pretty solid, but their latest seems like it was made for action. 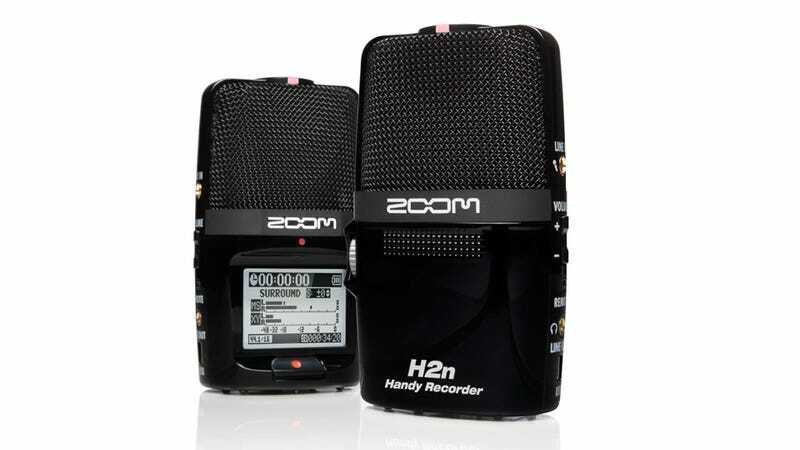 With its five onboard "studio quality" microphones, the Zoom H2n can hone in on the timidest of interviewees even under heavy fire. The H2n features a 1.8-inch backlit LCD screen and built-in speaker for instant playback. It'll also last you about 20 hours powered on 2 AA batteries. But it's the mic system that's truly noteworthy, since it's the first of its kind in a portable. The setup allows you to narrow and widen your recording range. So if you want to record a singer without the backing vocals or a soldier without the din of combat, you can. If you want to record in, say, 4-channel surround sound, you can. You can even change the levels of the side mics in post-production.